GYAN RILEY, guitarist and composer, won his first guitar in a raffle when he was 12 years old. After learning all of the songs in his cassette collection by ear, he began his life-long adventure in music, becoming the first full-scholarship graduate guitar student at the San Francisco Conservatory. 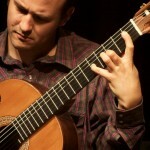 He then spent 15 years living in the Bay Area, touring as a classical guitar soloist and in various ensembles, including performances with Zakir Hussain, Michael Manring, Mike Marshall, Dawn Upshaw, the San Francisco Symphony, the Falla Guitar Trio, the World Guitar Ensemble and his father, the composer/pianist/vocalist Terry Riley. Along the way, he completed various compositional projects, including those commissioned by the Carnegie Hall Corporation, the American Composers Forum, and the New York Guitar Festival. Gyan's diverse work now focuses on his own compositions, improvisation, and contemporary classical repertoire. Recent performance highlights include Carnegie Hall, London’s Barbican Theatre, the All Tomorrow’s Parties Festival, the Big Ears Festival, Moogfest, and soloing with the Philadelphia Chamber Orchestra at Kimmel Center. Over the years, Riley has performed throughout Europe, Canada, Latin America and the US, both as a soloist and in various ensembles. Having recently relocated to New York City, Gyan can be frequently heard performing at such local venues as Le Poisson Rouge and Barbès, either in solo form or with various collaborators. Current ensemble projects include the duo Pluck with Wu Fei (guzheng and voice), the duo SuperBalls with David Cossin (percussion), the quintet Al-Madar, fronted by Bassam Saba (oud, ney, flutes), a duo with Terry Riley (piano, synth, voice), and a trio called Eviyan, with Iva Bittová (voice, violin), Evan Ziporyn (clarinets) and now a member of Dither, the electric guitar quartet. Gyan has four solo CD titles and several other ensemble/collaborative appearances, most recently recording for the Tzadik Records label in New York.